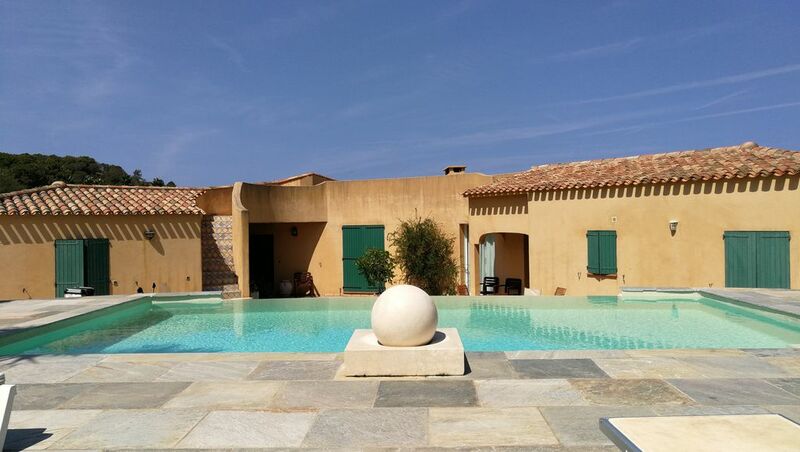 haute-corse for rent a beautiful hacienda-style villa with sea views and private pool at the Marine Davia near Ile Rousse. We are a family of five from Washington DC who spent a week at this beautiful place. Perfect place for a family vacation in Corsica. It's close to some of the best beaches and charming small towns in the mountains. The kids loved the pool and the parents loved sitting on the big patio at night enjoying a drink with a view over the Mediterranean. The house itself has plenty of space and nice big dinning/living room and kitchen with all the amenities you need. The landlord was very nice and checked in multiple times during the stay to make sure we had all we needed. Overall we had a great vacation and would love to come back to this place! He venido con mi familia desde Panamá a la isla Corsica y fueron 7 días de tranquilidad en la hermosa villa Felicita disfrute de su piscina y vista al mar y está completamente equipada para una estadia confortable. La Recomiendo a todos los Hispanos que visiten este hermoso paraíso. Très belle villa, emplacement parfait dans résidence de standing à deux pas de la plage. Gros point fort sur les extérieurs avec une magnifique piscine à débordement ou les enfants se sont bien amusés (et le d'adultes aussi ;) ). Magnifique propriété,extérieurs magnifique,piscine à débordement,cadre idyllique. Intérieur clair,équipé et spacieux,quatre chambres,tout confort. Proche de la mer environ 700 mètres et environ 3km de l île rousse. Choose to spend his vacation in Balagne, is enjoying all that nature offers us the sea and the mountains, but also a renowned gastronomy, or the famous festivals and Calvi fireworks. - On foot, by boat or 4x4, the Agriates desert delight you. - The road of the artisans of Balagne (PIGNA) you pass through small villages Corsica as we like, which sometimes overlook Ile-Rousse, sometimes Calvi bay. You can find many shops / workshops or the local know-how is emphasized. - For those about to rock, paragliding above the villages and beach Bodri. The sky certainly providing one of the most beautiful point of view of our region. - At Calvi you can also enjoy with your children the ropes. - Make a boat trip to visit one of the most beautiful reserves of Mediterranean Scandola, World Heritage of UNESCO. - Pascal Paoli (island-red) serves gourmet and authentic cuisine based on regional products. - The Libecciu (Ile-Rousse) modernity and originality are by appointment both in the room and on the plate. - La Siesta (Ile-Rousse) for breakfast a good fresh fish, and then relax on one of their sun lounger. - Eden (Port de Calvi) offers a sushi card (but not only) in a lounge atmosphere. - And of course the inevitable piano bar Chez Tao on the citadel of Calvi.